A rare and very attractive plan of Brooklyn, New York drawn in 1867 by Samuel Edward Stiles. 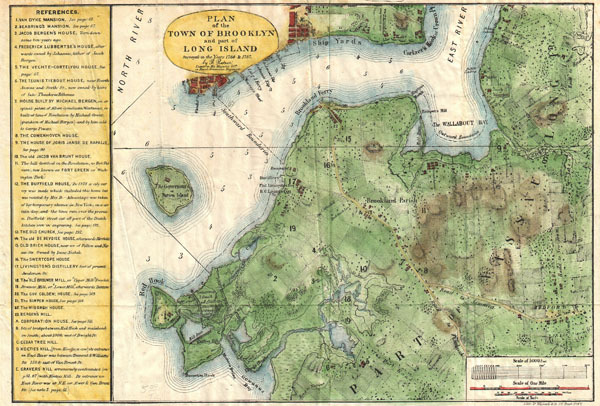 Designed for Stiles' important History of Brooklyn, this map is based upon surveys of Brooklyn originally taken in 1766 and 1767 by Bernard Ratzer. Includes much of modern Brooklyn including parts of Red Hook, Gowannas, Fort Greene, Williamsburg, part of Greenpoint, Brooklyn Heights, Cobble Hill Carrol Gardens, Park Slope, Prospect Height, Clinton Hill and Greenwood. Offers superb detail to the level of individual buildings, many of which are numbered and labeled in the interesting chart to the left of the map proper. Interestingly this chart notes both 18th century building locations as well as their 1867 street locations – many of which are consistent to modern times. Includes the Van Dyke Mansion, the Seabrings Mansion, the Jacob Bergen House, the Frederick Lubbertse House, the Vechte-Cortelyou House, the Teunis Tiebout House, the Michael Bergen House, the Cowenhoven House, the Jorse Janse de Rapalje House, the Jacob Ban Brunt House, the Duffield House, the OldChurch, the De Bevoise House, the Old Brick House, the Swertcope House, the Livingston Distillery, the Old Brouwer Mill, Brouwer Mill, the Governor's Colden House, the Bamper House, the Middagh House, Bergan's Hill, a Coporration House, Cedar Tree Hill, Koeties Kill and Gravers Kill. Drawn by Edward Stiles and engraved by Hayward and Company of 171 Pearl Street, New York. Samuel Edward Stiles (August 26, 1844 - October 9, 1901) was a 19th century historian and medical doctor based in Brooklyn, NY. As a child Stiles attended Brooklyn Public School No. 11. Graduating from High School, Stiles took work as a dry goods clerk. In 1864 Stiles was recruited by his elder brother, Dr. Henry Stiles, to work as an Assistant Librarian in the Long Island Historical Society. Working here Stiles developed a lifelong love of Brooklyn history. In 1867 he compiled his important multivolume History of Brooklyn. Afterwards Stiles turned his attention to the medical profession in which he became a prominent Brooklyn doctor and ardent supporter of Homeopathic medicine. Stiles died in 1901 and was survived by seven children. Stiles, S. E., History of the City of Brooklyn, Vol 1, page 62. Bulletin of the New York Public Library, vol. 4, 1902, Page 84.